Registration is open for a new inclusive dance group. No prior dance experience is needed! The group includes people who experience disability, as well as people who do not experience disability. WHO: Adults who are interested in teamwork, moving creatively, having fun, and respecting each other’s boundaries. The group brings together people with diverse capabilities (physical, mobility, sensory, mental health, neurological, cognitive, communication, developmental, intellectual and learning). Weekly sessions October 4th, 11th, 18th and 25th, and November 1st, 8th, 15th, 22nd and 29th. Followed by a celebration on Monday December 3rd and rehearsals and a sharing in January 2019. WHERE: 813 Darwin Avenue, in the Garth Homer Society auditorium, in the homelands of the Xwsepsum and Lekwungen Peoples and the Esquimalt and Songhees Nations. ACCESS: ASL interpretation available. The venue is mobility accessible. There are drop-off areas off of Darwin and Nigel Avenues. There are accessible washrooms, including one gender-neutral single-stall washroom. TO REGISTER: Click here for the online registration form. Alternative methods to register are: Click here for a print form, email: dance@drcvictoria.com, phone: 250-595-0044, or in person at 817A Fort Street (open weekdays 9 am to 4 pm). During the Fall we will explore inclusive dance concepts and movement improvisation, connect with each other and collaborate as a group. There is no “wrong” move. Our mobility tools and unique ways of moving and expressing can be lovely sources of creativity. One priority for the group is to welcome people who do not already have access to inclusive dance training. Another priority is to support delegates from local dance groups in building shared leadership skills in integrated dance. There will be opportunities, for participants who are interested, to try roles such as choreographer, sound person or photographer. The last page of the registration form includes a list of optional volunteer roles. There will be a volunteer orientation on September 27th from 1:00pm-2:00pm. The group will work towards sharing a site-specific work on January 26th and 27th during the Dance Days festival. There will be rehearsals on Thursdays from 1:00pm-2:00pm on January 10th, 17th and 24th, and likely on Mondays Jan. 7th, 14th and 21st. The dance group is for adults, with the possibility of younger people joining. If you are younger than 19 years old, please note your age on your registration form. Attendants and support people are encouraged to participate as members of the dance group. Registration forms will begin to be reviewed the week of September 4th. There will be a waiting list if there is more interest than there is room. People near the top of the waiting list will be encouraged to come on September 20th. 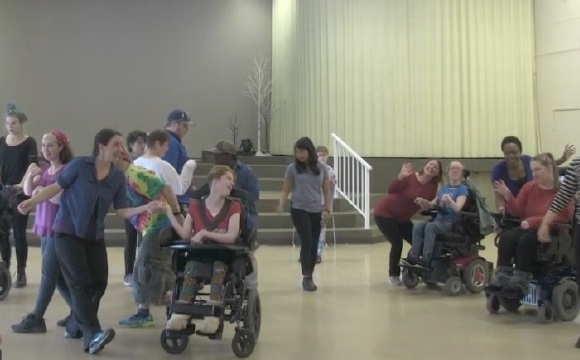 The group is facilitated by Joanne Cuffe, who facilitates dance with people with diverse ways of moving, perceiving and interacting, in partnership with a dozen organizations. Joanne collaborates with people with diverse abilities, ages (10-103+), backgrounds, gender identities and sexualities. Click here to read the facilitator’s bio. For questions, contact dance@drcvictoria.com or 250-595-0044. The Mixed-Abilities Dance Group is a pilot project, from September 2018-January 2019, sponsored by VDRC. We are grateful for CRD Arts Development support with an Equity Grant, for Garth Homer Society providing the space, and for Made in BC – Dance on Tour’s support. We warmly invite donors to connect with us about sponsoring the group’s continuation for February-June 2019 and beyond. Funding covers facilitation, access costs including sign language interpretation and project administration, so that cost is not a barrier to participation. To contribute to the Mixed-Abilities Dance Group, visit our donation page.